↑ "李嘉诚："说真话 做实事 有贡献"". 亞太日报. 2013-03-27. （原先內容喺2013-03-30歸檔）. 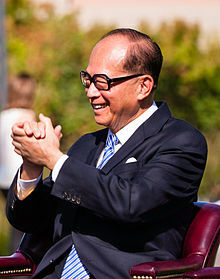 ↑ "Li Ka-shing". Forbes. 喺14 May 2015搵到. ↑ "SUPPLEMENT No. 1 to Issue 51578", London Gazette, 30 December 1988, p. 16.